A lot can change in five years. More so in a sector like Indian aviation that is forever in flux. In 2013, when the Abu Dhabi-based Etihad Airways acquired a 24% stake in Jet Airways for $379 million (then around Rs2,060 crore), the Indian carrier’s promoter, Naresh Goyal, managed to keep his nose ahead in the deal. This was the first foreign investment deal signed a year after India permitted overseas carriers to own minority stakes in domestic airlines. At the time, Etihad bought the shares of Jet at Rs754.74 apiece—a good 31.55% premium to the Rs573.85 market price as on April 23, 2013, the eve of the announcement. Now, the debt-laden Jet has once again turned to its international partner to rescue it from a precarious financial situation. However, Etihad is willing to pay only Rs150 per share, if at all it agrees to be a white knight and increases its stake in Jet, CNBC TV18 and The Economic Times newspaper reported on Jan. 16. This is a significant 45% markdown from Jet’s closing share price of Rs271.75 on the BSE stock exchange on Wednesday (Jan. 16). Etihad has also reportedly called for chairman Goyal to step down from Jet’s board of directors, and reduce his 51% stake in the company he founded to 22%. Clearly, for the embattled Indian carrier, times have changed. Etihad now has the ability to drive a hard bargain on account of Jet’s weakened standing in the market. “One good indicator would be market share. Jet had a higher market share back in 2013,” said Ashish Nainan, research analyst at CARE Ratings. In the past five years, while Jet has retained its position as the no. 2 airline by passengers flown, it has steadily ceded market share to budget carrier IndiGo. Jet is also saddled with a debt of Rs8,052 crore ($1.15 billion) as on Sept. 30, and has reported losses exceeding Rs1,000 crore for three consecutive financial quarters. On the last day of 2018, it defaulted on a loan from a consortium of banks led by the State Bank of India, prompting the ratings agency ICRA to downgrade its debt from C to D (default) category. However, broader trends may also have a hand behind the lower offer from Etihad. “Between (2013) and today, industry-level economics have changed significantly. Oil prices are higher, and overall competition is also slightly higher,” said Subrata Ray, senior group vice-president at ICRA. 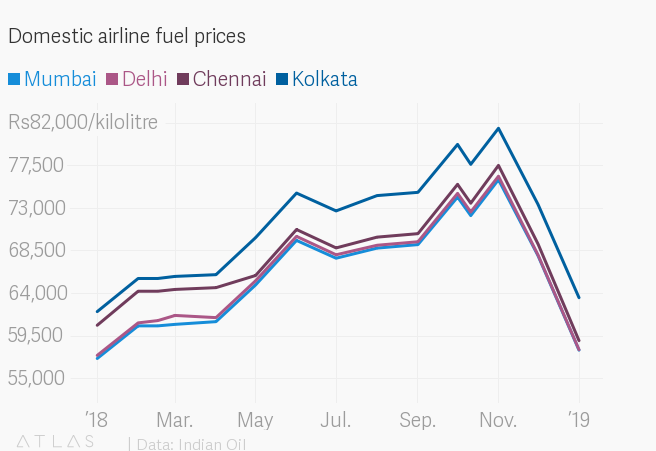 Almost throughout 2018, airlines in India suffered from the double-whammy of rising aviation turbine fuel (ATF) prices and a depreciation of the Indian rupee. In some relief, ATF prices have fallen since December, and the rupee now appears stable after depreciating by over 9% against the dollar since last January. Price competition in the industry, however, refuses to abate. Just today (Jan. 17), Vistara, India’s only other private full-service carrier besides Jet, is holding an anniversary sale with fares starting at Rs899 ($13) on the Bagdogra to Guwahati route. Moreover, there may be little support from the Indian government, unlike in 2013. Back then, India’s ministry of civil aviation had signed a bilateral agreement with Abu Dhabi, expanding Etihad’s flying rights in the country. This was widely seen as a quid pro quo for the Gulf carrier’s investment in Jet. This time, however, minister Suresh Prabhu has maintained that the government will not intervene for Jet in any way.